By Michael McCann, Ph.D, C.I.H. A wide variety of toxic airborne organic vapors, gases, spray mists, fumes and dusts are produced by materials used in the visual arts, theater and conservation. Ventilation should be the first line of defense against these airborne materials. In certain circumstances, ventilation is not adequate and respiratory protection is necessary. OSHA permits the use of respirators only when effective engineering controls are not feasible, or while they are being instituted. In fact, proper use of respirators takes a lot more effort and knowledge than many people assume. Employees wearing respirators come under OSHA's respirator standard. This standard (29 CFR 1910.134) has just been updated. The revised standard became effective April 8, 1998, with employers having to be in complete compliance by October 5, 1998. The revised standard can be found on CSA's web site (http://artswire.org:70/1/csa) in the Precautions subdirectory. The revised standard has several new or enlarged requirements: a written plan with work-site specific procedures; a hazard evaluation to determine respiratory hazards and work conditions in order to help in respirator selection (compliance date September 8, 1998); medical evaluations to determine the ability of employees to wear a particular respirator; fit testing of tight-fitting respirators; training in the safe use of respirators; and regular respirator program evaluations. OSHA requires employers to develop and implement a written respiratory protection program with work-specific procedures and procedures for respirator use. The program must be administered by a trained administrator, and must include the following features. Whenever respirators are necessary to protect health or whenever an employer requires wearing of respirators, there must be a written respiratory protection program with the following elements: procedures for selecting respirators; medical evaluation of employees required to wear respirators; fit-testing procedures for tight-fitting respirators; procedures for proper use of respirators in routine and emergency situations; procedures and schedules for maintenance of respirators; procedures for proper functioning of atmosphere-supplying respirators; training of employees in hazards and proper use of respirators; and procedures for regularly evaluating the effectiveness of the program. If respirator use is not required: An employer may provide employees with respirators or allow employees to use their own respirators, if the employer determines such respirator use will not create a hazard. If voluntary respirator wearing is allowed, then the employer must provide the information in Appendix D of the respirator standard to the respirator user; An employer must have a written respirator program that includes medical evaluation of ability to wear a respirator and adequate maintenance of the respirator. An exception is when an employee voluntarily wears a filtering facepiece (dust mask), whether provided by the employee or employer. However the employer must still make sure the dust mask is not a hazard to the wearer and is not dirty or contaminated. An employer shall designate a program administrator who is qualified by training or experience to administer the program. Employers shall provide respirators, training, and medical evaluations at no cost to the employee. Atmosphere-supplying respirators provide a source of clean air from compressed air tanks or compressors. Examples are supplied air (airline) respirators and self-contained breathing apparatus (SCBA). For situations involving oxygen deficiency or that are immediately dangerous to life or health (IDLH), only full-facepiece pressure demand SCBA certified by NIOSH for a minimum service life of 30 minutes, or a full facepiece pressure demand airline respirator with auxiliary self-contained air supply is acceptable. Pressure demand or positive pressure respirators are respirators in which there is always a positive air pressure inside the facepiece so that contaminated air cannot leak into the facepiece. The source of air for atmosphere-supplying respirators can be compressed or liquid oxygen or compressed air. Compressed or liquid oxygen must meed the US Pharmacopoeia requirements for medical or breathing oxygen. Compressed air must meet the specifications for Type I-Grade D breathing air: 19.5 - 23.5 % oxygen, less than 5 mg/cu.m. of hydrocarbons, less than 10 ppm carbon monoxide, less than 1000 ppm carbon dioxide, and no noticeable odors. OSHA has other requirements for cylinders. Since the use of supplied air respirators is more complicated than air purifying respirators, it is imperative that people wearing these have adequate and training in their use and practice with them on a regular basis. Air-purifying respirators remove contaminants from the air in a given location in a variety of ways, including filtering particulates from the air, absorbing the contaminant, or chemically reacting with the contaminant. The air is pulled into the face-piece by lung power, which creates a negative pressure inside the face-piece during inhalation. Thus if the fit is not perfect, contaminants can leak into the face-piece because of this negative pressure. Air-purifying respirators come in two types: gaseous and particulate. There can also be combinations of the two. Gaseous types contain cartridges for organic vapors (e.g. solvent vapors), ammonia, and acid gases (e.g. for chlorine bleach, sulfur dioxide, hydrogen chloride). In the past, particulate filters included ones for paint spray, dusts and mists (DM); dusts, mists and fumes (DMF, e.g. for welding fumes); and high efficiency (HEPA) filters. In 1995, NIOSH published revised standards for particulate respirators. The new regulation provides for nine classes of filters: three levels of filter efficiency, each with three categories of resistance to filter efficiency degradation from oil. The three levels of filter efficiency are 95%, 99%, and 99.97%. The three categories of resistance to filter efficiency degradation are labeled N (not resistant to oil) , R (resistant to oil for a limited time), and P (oil-proof). N95 and N99 filters outperform DM and DMF filters. Air-purifying respirators cannot be used in oxygen-deficient atmospheres, in IDLH situations, or for very high concentrations of contaminants. They also should not be used for chemicals with poor warning properties (when air concentrations at or above the recommended exposure levels create no observable odor, irritation or taste) because there is no way to detect when the cartridge is no longer removing the contaminants. Examples include methyl alcohol, nitrogen dioxide, isocyanates, and carbon monoxide. Air-purifying respirators should also not be relied upon to give adequate protection against cancer-causing chemicals (carcinogens) because they are not 100% efficient and do allow some contaminants to penetrate through the respirator (see section below onprotection factors). Finally, air-purifying respirators are not to be used for abrasive blasting because this type of respirator is not approved for very high levels of particulates (see protection factors below). PAPRs actually come under the classification of air-purifying respirators. They differ, however, in that the air is pumped through the cartridge or filter so that there is always a positive pressure inside the respirator face-piece. This reduces a major disadvantage of air-purifying respirators which create a negative pressure inside the face piece. The same restrictions applying to air-purifying respirators apply to powered air-purifying respirators. In addition they are only approved for particulates, although there are also cartridges for gaseous contaminants. Recently there have been studies indicating that they do not provide as great a protection factor as originally thought. Respirator face-pieces come in a variety of types and sizes. These include: hoods, which cover the entire head and shoulders; full-facepiece types, (typified by the classic "gas mask", and required for protection against eye irritants); half-facepiece types which cover mouth, nose, and chin; quarter-facepiece types, covering the mouth and nose; and filtering facepieces (dust masks). The revised OSHA standard defines filtering facepieces as a negative pressure air-purifying particulate respirator with a filter as an integral part of the facepiece or with the entire facepiece consisting of the filtering medium. These dust masks do not have to have full written respirator programs. Respirators must be selected for the particular contaminants, their physical state, and exposure conditions that will be encountered by the individual wearing the respirator. The revised OSHA respirator standard requires that employers evaluate respiratory hazards in the workplace and exposure conditions in order to assist in respirator selection. (This must be completed by September 8, 1998.) If the employer can't identify or reasonably estimate the level of exposure to a contaminant, the employer shall consider the atmosphere to be IDLH (immediately dangerous to life or health). Table 1 is a general protocol for determining the allowable types of respirators for a given contaminant and conditions. Table 2 is a more specific selection chart for types of filters and cartridges for various art processes. At high concentrations of toxic contaminants, air-supplied respirators might become necessary instead of air-purifying types. Different types of respirators vary in the degree of efficiency with which they can protect. To properly select a respirator, you need to know the actual concentration of the contaminant in the work area, the Threshold Limit Value (or OSHA Permissible Exposure Limit) of the contaminant, and the rated Protection Factor of the various types of respirators. The Protection Factor of a respirator is defined as the concentration outside the respirator divided by the concentration inside the respirator. These protection factors are developed from laboratory studies. Table 3 gives the Protection Factors for a variety of respirators based on recommendations from NIOSH. (OSHA will be issuing Protection Factors in the future) You can obtain the maximum concentration of the contaminant for which you can use a given respirator by multiplying the Protection Factor for that respirator by the recommended exposure level for the contaminant of concern. If the actual concentration is higher than the calculated maximum concentration, then you need to select a respirator with a higher Protection Factor. For example, suppose someone is exposed to xylene, which has a Threshold Limit Value of 100 ppm. The standard half-face respirator with organic vapor cartridges has a Protection Factor of 10. Therefore, for xylene, the maximum concentration against which this respirator can be used is 1000 ppm. If the actual concentration is greater than 1000 ppm, then a full-face respirator or a supplied-air respirator would be needed. If the concentration of the substance is unknown and can not be estimated, particularly if it is one that can be immediately dangerous to life or health, then a positive-pressure SCBA type or positive-pressure demand airline respirator with emergency SCBA should be used. This would apply, for example, in many spill situations. In some cases, cartridges for gaseous contaminants have limitations for exposure concentrations not related to the face-piece. In such instances, the most protective respirator should be used. Before requiring an employee to be fit tested for a respirator, a medical evaluation must be provided to determine the ability of the employee to wear a respirator since respirators put an extra strain on the heart and lungs. OSHA does not require a medical examination; at the minimum, the medical evaluation can be done by a questionnaire found in Appendix C of the revised standard. The evaluation must be performed by a physician or other licensed health care professional qualified to do the evaluation. The OSHA standard has further requirements on what information must be provided to the health care professional and what information they can divulge to the employer. Persons with heart or lung diseases such as arrhythmias, asthma, emphysema, and chronic bronchitis may be limited in their ability to wear a particular type of respirator. Other medical factors that could limit respirator use include anemia, hemophilia, poor eyesight or hearing (i.e. not being able to detect warnings), lack of proper use of fingers or hands, and claustrophobia. In cases where a medical condition would limit the use of negative-pressure air-purifying respirators, the employer must provide a powered air-purifying respirator if the health professional finds the employee can use one. Additional medical evaluations must be done if an employee reports symptoms related to his or her ability to wear a respirator, if the health care provider or supervisor or respiratory program administrator indicates the need, or if there is a change in workplace conditions that might result in an increased physiological strain on the employee. If a respirator with a tight-fitting facepiece does not fit properly, then it is not serving its intended purpose. In order to fit, there must be an adequate seal between the face-piece and the wearer's face. Anything interfering with this seal can allow inward leakage of contaminants. There are a variety of factors affecting the fit of a respirator, including the model and size of the face-piece, facial characteristics, and eyeglasses. No two people have the same size and shape of face. Similarly there are variations in shape of respirator face-pieces between the different models of respirators. As a result, it cannot be expected that one size or model of respirator would fit everyone. 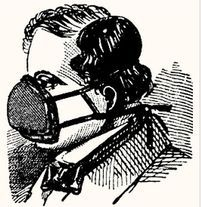 Until a few years ago, respirators were designed to fit men only, and women and others with small faces found it impossible to get a proper fit with a respirator. Today most major respirator manufacturers make a variety of models and sizes. It is therefore advisable, and is required by OSHA, to provide a variety of makes and sizes available to be certain of a proper fit. Beards, sideburns or other facial hair between the face-piece and the skin will prevent you from obtaining a proper respirator to face seal. Many men who shave regularly can even find difficulty in getting a proper fit if they have a heavy growth during the day. In some instances it is necessary to shave just before putting on the respirator. In addition facial scars, missing teeth, and a broken nose can prevent a proper fit. Eyeglasses can also prevent a proper fit if the temple bars of eyeglasses interfere with the seal of the respirator. Changing eyeglass styles can often help. Another solution is to mount corrective lenses inside a full-face respirator. OSHA requires annual fit testing to determine if a respirator with a tight-fitting facepiece fits properly. Employees must also be fit tested if a different respirator facepiece is used, or if there is any question about the fit of the respirator. If the employee notifies the employer that the fit is unacceptable (even after passing a fit test) then the employee shall be given a reasonable opportunity to select another respirator and be retested. There are two basic types of fit tests: quantitative and qualitative. Quantitative fit testing involves exposing the respirator wearer to an atmosphere of some agent such as corn oil and measuring the concentration of this agent both inside and outside the respirator. This is the best method but is expensive. Qualitative fit testing involves exposing the respirator wearer to an agent which can be detected by irritation, odor or taste. Examples of approved qualitative fit testing agents include isoamyl acetate (banana oil), irritant smoke, saccharin mist, and Bitrex. The isoamyl acetate requires an organic vapor cartridge and the irritant smoke, saccharin and Bitrex require a particulate filter. Qualitative fit testing may only used to test negative pressure air-purifying respirators that must achieve a fit factor of 100 or less. The following are the general steps required by OSHA for qualitative fit testing. The entire protocol can be found in the mandatory Appendix A of the respirator standard. The person to be tested shall be allowed to select the most acceptable respirator from a variety of choices. Prior to selection, the person shall be shown how to put on and adjust a respirator. The selected respirators is put on and worn for at least 5 minutes to assess comfort. Adequacy of the fit shall be checked using listed criteria. The test subject shall conduct either a positive or negative-pressure seal check as described in Appendix B-1. The fit test procedure shall be described, including exercises to be performed. The fit test will be performed wearing any other personal protective equipment that would be normally worn and which could affect respirator fit. For qualitative fit tests, a threshold sensitivity test will be performed to determine if the person can detect the odor, taste or other response used to indicate a poor fit. The person shall conduct the following 1-minute exercises while wearing the respirator in the fit testing atmosphere: normal breathing; deep breathing; turning head side to side; moving head up and down; talking; bending over; and repeat of normal breathing. If a person fails a fit test with a given respirator, the procedure is repeated with a different respirator. Records of fit tests must be kept until the next fit test. OSHA requires employers to establish procedures for the proper use of respirators. These include: prohibiting conditions that would interfere with the facepiece seal. Employers shall not allow employees with tight-fitting facepieces to be worn by employees who have facial hair that comes between the sealing surface of the facepiece and the face or have any other condition that would interfere with the seal or valve function. Employers shall ensure that corrective glasses or goggles or other personal protective equipment worn by employees does not interfere with the facepiece seal. Employees wearing respirators with tight-fitting facepieces must perform a user seal check each time they wear the respirator, as described in Appendix B-1 (or approved manufacturer procedures). Ongoing surveillance of the workplace conditions to determine if they may affect respirator effectiveness. Employers shall ensure that employees leave respirator use area to 1) wash their faces as needed to prevent eye or skin irritation; 2) if they detect vapor or gas breakthrough, changes in breathing resistance or leakage; and 3) to replace filers, cartridges or canisters. Employers must have proper emergency procedures for use of respirators in IDLH atmospheres. One of the major disadvantages of air-purifying respirators is that the cartridges become saturated with the gaseous contaminant and breakthrough of the contaminant occurs into the lungs. The revised OSHA standard requires that air-purifying respirators be equipped with end-of-service indicators certified by NIOSH for the contaminant or that the employer implement a change of cartridge schedule based on objective data. The data relied on shall be included in the respirator program. In the absence of air sampling data to help determine when to change cartridges, the respirator manufacturer should be consulted. In any case, change cartridges if odor breakthrough is detected. With filter cartridges, the more particulates collected on the filter, the more efficient the filtering action. Particulate filters should get changed whenever it becomes difficult to breathe through them. OSHA requires employers to provide for cleaning and disinfecting, storage, inspection and repair of respirators used by employees. Appendix B-2 of the respirator standard specifies cleaning and disinfection procedures. Respirators used by one person shall be cleaned and disinfected as needed to maintain them in a sanitary condition. Respirators worn by more than one person shall be cleaned and disinfected before being worn by different individuals. Emergency respirators shall be cleaned and disinfected after every use. Respirators shall be stored to protect them from damage, contamination, lights, temperature extremes, etc. Respirators used routinely shall be inspected before each use and during cleaning. Inspections must include a check of respirator function, tightness of connections, condition of various parts including valves, straps, facepiece, etc. There are special procedures for emergency and escape-only respirators. Defective respirators must be repaired before being used. Repairs must be done by trained personnel. Employees required to wear respirators must be trained before being required to use a respirator, and at least annually thereafter. The training must be understandable by the employees and employers must demonstrate that employees know at least the following: why the respirator is needed and the how improper fit, use or maintenance can affect its effectiveness; limitations and capabilities of the respirator; what to do in emergency situations, including cases of respirator malfunction; how to inspect, put on and remove, and check the seal of the respirator; how to recognize medical signs that may limit or prevent respirator use; the general requirements of the OSHA respirator standard. Employees voluntarily wearing respirators must be given the information in Appendix D.
Employers must conduct regular evaluations of the workplace to ensure that the written respiratory program is being properly implemented. This shall include consulting employees about the effectiveness of the program. Factors to be assessed include: respirator fit; appropriate respirator selection; proper respirator use under existing workplace conditions; proper respirator maintenance. OSHA regulations only apply to employees, and do not cover students (unless they are working for the Art Department). However, in order to protect students, it is good practice to use the same procedures for respirator use with students as is required for employees. However, I would not recommend that students ever be in situations where atmosphere-supplying respirators are required for reasons of the complexity of the equipment, the danger of accidents, and possible liability in case of accidents. 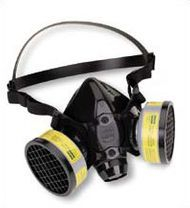 Respirators can be obtained from safety equipment distributors. These can be found in your local area by looking in the Yellow Pages under "safety equipment". Below is a list of some safety equipment distributors in various parts of the country. Many of these have several branch offices. American National Standards Institute. American National Standard for Respiratory Protection - Protection During Fumigation. ANSI Z88.3-1983. New York (1983). American National Standards Institute. American National Standard Practices for Respiratory Protection. ANSI Z88.2-1980. New York (1980). National Institute for Occupational Safety and Health. A Guide to Industrial Respiratory Protection DHEW (NIOSH) #76-189, Government Printing Office, Washington, DC (1976). National Institute for Occupational Safety and Health. NIOSH Certified Equipment List As of October 1, 1987. DHEW (NIOSH) #88-107. Government Printing Office, Washington, DC (1988). Updated regularly. National Institute for Occupational Safety and Health. NIOSH Respirator Decision Logic. DHEW (NIOSH) #87-108. Government Printing Office, Washington DC (1987). National Institute for Occupational Safety and Health. Respiratory Protection: An Employers Manual, DHEW (NIOSH) #78-138A. Government Printing Office, Washington, DC (1978). National Institute for Occupational Safety and Health. Respiratory Protection: A Guide for the Employee, DHEW (NIOSH) #78-138B. Government Printing Office, Washington, DC (1978). Occupational Health and Safety Products Division/3M, Administrative Respiratory Protection Program. 3M Center, St. Paul, Minnesota. Occupational Safety and Health Administration. Occupational Safety and Health Standards for General Industry - Respiratory Protection. 29 CFR 1910.134. Government Printing Office, Washington, DC (1981). This data sheet was made possible with the assistance of public funding from the National Museum Act and the Museum Aid Program of the New York State Council on the Arts. This article was originally printed for Art Hazard News, © copyright Center for Safety in the Arts 1998. It appears on nontoxicprint courtesy of the Health in the Arts Program, University of Illinois at Chicago, who have curated a collection of these articles from their archive which are still relevant to artists today.